I have a year of in-game time on one character and I haven't played properly in 5-7 years. I'm certainly not proud of it. Maybe I should buy another PC. Despite the gloomy long term outlook it was a good weekend for boatviolence. Who is going to play Project Nova and buy its skins and bunny ears if people are playing Eve? Oh well, at least the carebears will be happy in their inflation heaven pvp free server. Do not tell me this came as a surprise. CCP's been quite clear on priorities towards sale and preferences in game design required for several years now. The moment they decided that supercap proliferation was a phenomenon that could be reliably tied into monetisation, niche gameplay and broadening of player type scopes it was clear that monolithic mass industry zonal player organisation would be reinforced and tied to shortcut constructs. I definitely quit at a high point. While I don't think this is a great development since it helps capital projection, at the same time I do disagree with the extent of the doom & gloom predictions. Cap ships are slow to align and slow to warp. Gate travel with them is nowhere near as fast as the constant cyno jumps of days gone by. This will make it easier to get across the galaxy for sure. But it's going to take a lot longer than a "few minutes". The mobility element in this actually isn't so much capital projection, but lane projection. See the Vegas highlights on the new structures by themselves. CCP aims for consolidation of large organisation through perception of increased strategic risks. 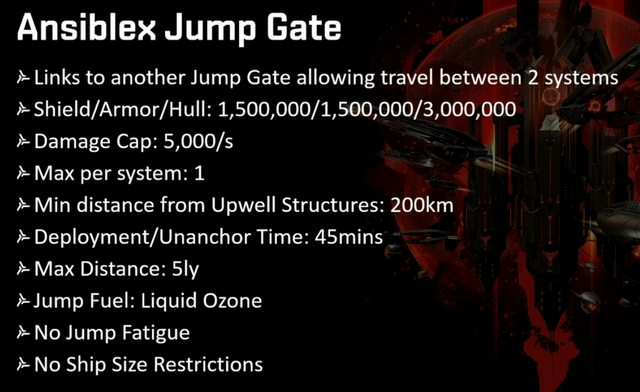 It'll be funny once players start pointing out that CCP is encouraging status quo behaviour when this is exactly what they aim to encourage. Widening the base, deeper investments, consolidation of political zoning and so forth. That also extends to deployment concepts of force projection under the new variables. I can't even be bothered to be angry about it any more. Cap ships are slow to align and slow to warp. Gate travel with them is nowhere near as fast as the constant cyno jumps of days gone by. They take 10 seconds, same as anything else that can fit a MWD. All times are GMT. The time now is 05:03:41 PM.